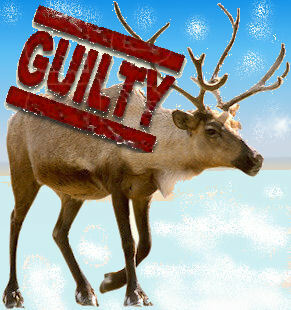 Fat, Greedy and White---guilty ungulate “Rudy” reacts to news that responsibility for the infamous St. Matthew Island Reindeer die-off is now attributed to his appetite, rather than to excessive reindeer numbers. Had he eaten lichen modestly, a scientific report says, other reindeer could have lived and the island’s bio-capacity would not have been exceeded. According to data released by the GHN (Global Hoofprint Network) in San Francisco, if all reindeer consumed as much as Rudy did, four planets would have been needed to supply the species sustainably. The decision to rename the island came in the wake of a report commissioned by the Sierra Club—and paid for by billionaire David Gelbaum and several of their big corporate donors like natural gas fracker Cheasepeake Energy---that while greedy reindeer of the Northern Hemisphere make up only 5% of the global ungulate population, they account for fully 25% of the total amount of lichen consumed in a given year. Constant repetition of that statistic is now mandatory for every college student who hopes to graduate with a degree in Environmental Studies, Political Science or Communications. Education ministries across the continent have now determined that rote memorization of clichés like these is more cost-efficient than actually teaching young people four years worth of real science. In other words, the name change was thought necessary to fit the new paradigm, and signalled a watershed moment in the evolution of environmental thinking. Gone is the hopelessly unfashionable and politically incorrect foundational formula of the environmental movement, which assigned critical importance to the population level of a given species when gauging its ecological impact. 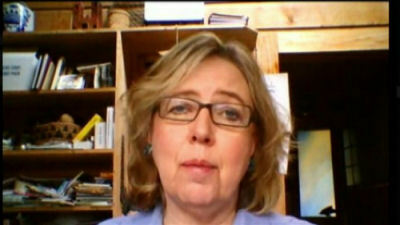 Ms. May recommended that the environmental movement continue to follow its true mission---the inculcation of guilt for bad behaviour, and the pursuit of “good feelings” among its adherents by making trivial lifestyle changes rather than measuring their success by the achievement of meaningful concrete results. So it is all now official. There is enough lichen in the world to go around, if only it is shared equally and consumed responsibly. Breed on. Now I don’t claim to be an A student baby or an authentic Green Party Leader either, and I …. what a wonderful sustainable world this would be. From reports of hungry reindeer shortly before that last disastrous winter the reindeer really did cut back their individual consumption, significantly. Collectively though, their consumption was unsustainable as they were grossly overpopulated. The green left would do well to appreciate this lesson.